Tropico 6, originally due out this month, has been pushed back to March, so you’ll need to put your plans for a new banana republic on the back-burner. After running a closed beta last year, Kalypso and Limbic decided to delay launch to give them more time to implement feedback and polish up the management sim. 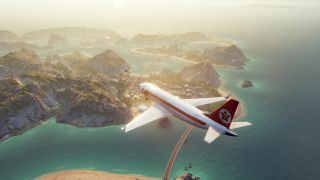 “Over the holidays, I have played Tropico 6 for many hours and really liked what I saw,” Kalypso managing director Simon Hellwig wrote in a letter to the community. “But, in my humble opinion, it is not enough to like a game—I want to love it! And Tropico 6 is good, but not very good, or outstanding. Yet. Features getting an extra layer of polish include pathfinding, multiplayer and the simulation of both Tropicans and the economy. The latter was one of the big things Kalypso and Limbic were touting when I previewed Tropico 6 for the magazine. The lives of your Tropicans will interfere more with your plans as they go about their routine and develop expectations or set themselves goals. It’s an expansion of a system that has, in previous Tropicos, been a lot more abstract. Despite the enhanced simulation and new archipelagos, it’s still familiar. Because of the delay, if you preordered Tropico 6, or do so by 8pm CET on January 10, via the official shop, Steam or other digital stores, you’ll receive the first DLC for free. The DLC due out later this year.